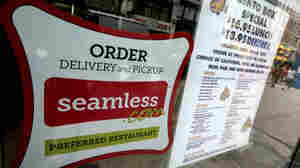 August 12, 2013  If you're a takeout or delivery customer, websites like Seamless and Grubhub are a marvel. Just type, click your order and the food is on its way. But if you're a restaurant, this shift to the web may not sit so well with you. March 7, 2013  Demand for local foods is growing, but in many places, there still aren't efficient networks for getting them to consumers. A San Francisco startup called Good Eggs is trying out a new model: It's acting as the middleman, letting customers order from lots of different local producers and then delivering straight to their homes. August 24, 2012  Small private school students ordered 70 percent more food than others between midnight and 2 a.m. That could be because they tend to have more money and fewer on-campus dining options during those hours.